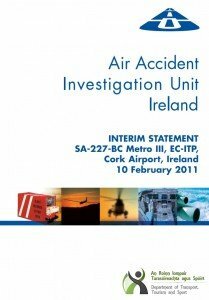 The Irish Air Accident Investigation Unit (AAIU) released an interim report of the investigation into a fatal accident involving a Metro III passenger plane at Cork Airport, February 10, 2011. A Swearingen SA-227BC Metro III passenger plane, registered EC-ITP, was damaged beyond repair in a landing accident at Cork Airport (ORK), Ireland. There were 10 passengers and two crew members on board. Both crew members and four passengers were killed. 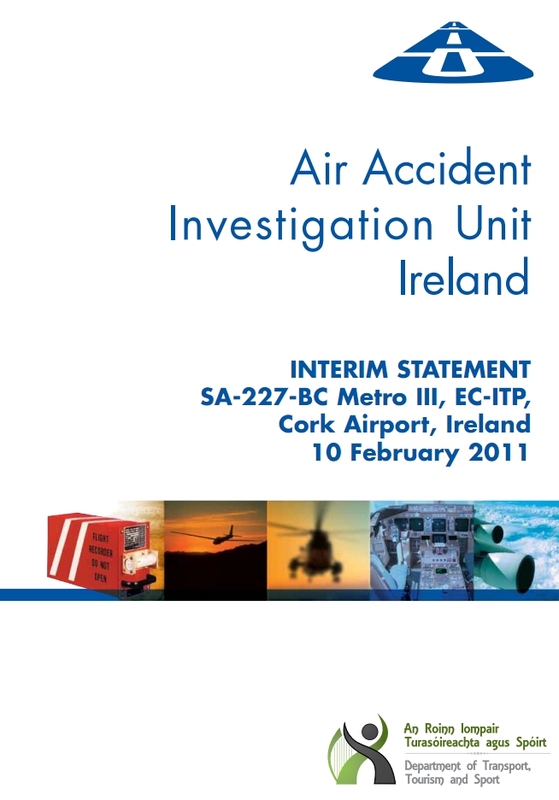 The AAIU issued a preliminary report on March 16, 2011. The interim report details the work accomplished by the investigators. Amongst others, analysis of FDR data showed that, from the earliest recordings (106 hours prior to the accident) there was a mismatch between the torques being delivered by the two engines. In general, the recordings showed that the torque being delivered by No. 2 engine exceeded that being delivered by No. 1 engine by up to 5%. It was also noted that, as the power levers for both engines were being advanced prior to take-offs, the torque response for No. 2 engine was faster than that for No. 1 engine. This was traced back to an anomaly in the No. 2 engine Pt2/Tt2 sensor which senses inlet air temperature (Tt2) and inlet air pressure (Pt2). The sensor was outputting a temperature value up to 135°F below the actual total temperature to the No. 2 fuel control unit (FCU). This cold temperature signal resulted in incorrect scheduling of fuel flow to the No. 2 engine. FDR data for the accident flight showed that, approximately eight seconds before the impact, the No. 1 engine torque was recorded at a value of -9% (negative torque). In approximately the same time-frame, the No. 2 engine torque had a minimum recorded torque value of 0%. The recorded torque levels for both engines subsequently increased rapidly and the engines remained at high power until impact. During the final seven seconds of the CVR recording, the stall warning horn aural alarm was heard on the recording. The Investigation is currently carrying out a flight path analysis with the assistance of the NTSB, which will analyse the complex aerodynamic factors involved during the final phase of flight. This analysis, together with the limited FDR data available, may provide additional information regarding the loss of control of the aircraft. undertaking selling the service (Ticket Seller), and the undertaking which supplied the aircraft and flight crew, is continuing.